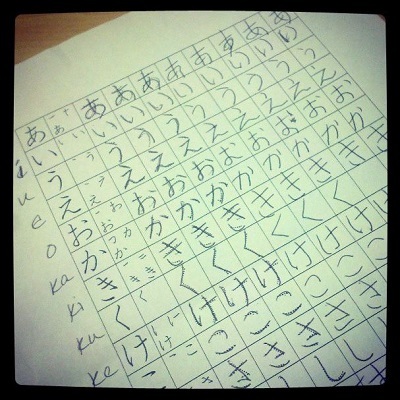 Learning Japanese, I think I’m learning Japanese. . . This has been the year to start turning some of those things on the “Oh, We’ll Do That Some Day” list into reality. Earlier in the year, we started homebrewing (the best kind of science on the planet). My husband finally took those sailing lessons he’s been talking about the last couple of summers. Then, after the unexpected passing of a family member put more of everything into perspective, we decided to kick it up a notch further so now…. we’re learning Japanese! We had our very first class tonight and the whole experience was both mind-boggling and exciting. My husband is a systems administrator and has done some continuing education type classes recently. I, however, have a degree in theatre and haven’t stepped foot in a legitimate classroom type setting since college. Neither of us really had any clue what to expect exactly but the older Japanese woman speaking a rapid-fire mix of English and Japanese with the mannerisms and cadence of a character straight out of an anime pretty much had our eyes as wide as dinner plates and our jaws slack down to the floor. 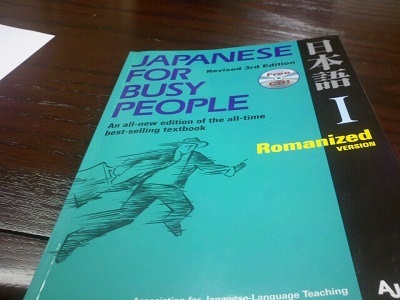 The first 20 minutes of class were a blur of kana and vowel sounds. The textbook is designed for business which is really quite smart. It teaches you how to introduce yourself in a business setting, telling people where you work and what your title is. Accents – I don’t understand how the accent on a word is determined but, if some of my preliminary reading is correct, it seems like this is something that’s conceptually totally different than what I (as an English speaker) am used to. Grammar – just digging into the nerdery that is diagramming sentences in any kind of capacity is going to really get me excited. Writing – I’m really fascinated by the alphabet and the history of the characters. I think the attention to the handwritten alphabet is refreshing and looking forward to learning more about why things are done the way they are. Do you have a bucket list of nerdy (or not) things that you’ve put off? What’s on yours? Maybe the first item on our bucket list is to make a bucket list. It would be really *really* cool to watch anime and play video games in Japanese… I’m just sayin’.